Unsurprisingly, the opioid crisis was a major topic of conversation at the 2019 Workers’ Compensation Research Institute’s (WCRI) Annual Issues and Research Conference. Workers’ compensation insurance has been particularly affected by the crisis. Opioid use can, perversely, increase a worker’s risk of disability. Opioid use can lead to dependency, which results in increased dosages and higher costs. Dependency can lead to abuse; abuse can result in on-the-job performance impairment and further injuries – or it can delay a worker’s ability to return to work. In the worst case scenario, abuse leads to addiction and death. These are just some of the reasons why opioid use can significantly increase the costs of workers’ compensation claims. 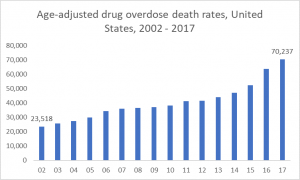 The Centers for Disease Control and Prevention (CDC) found that 70,327 people died from fatal drug overdoses in the U.S. in 2017. That’s up from 63,632 in 2016 and 23,518 in 2002, a three-fold increase in absolute terms in 15 years. 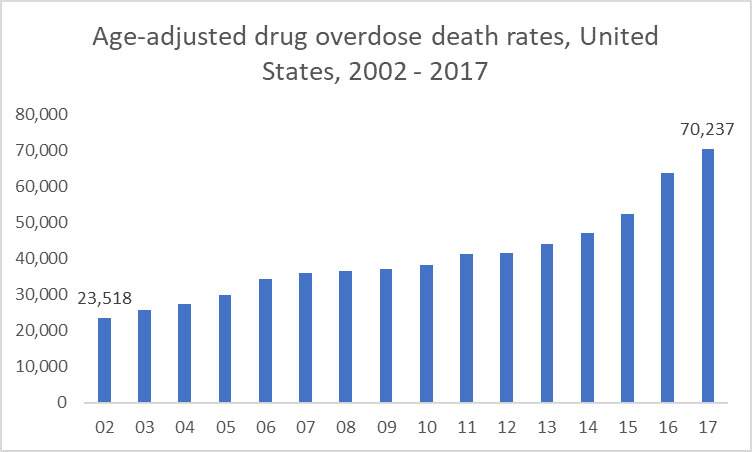 But of course, the U.S. population grew over that time – and the death rate per 100,000 people is also alarming, rising from 8.2 in 2002 to 21.7 in 2017. More alarming yet, the opioid epidemic continues to drive a significant portion of total drug overdose deaths. 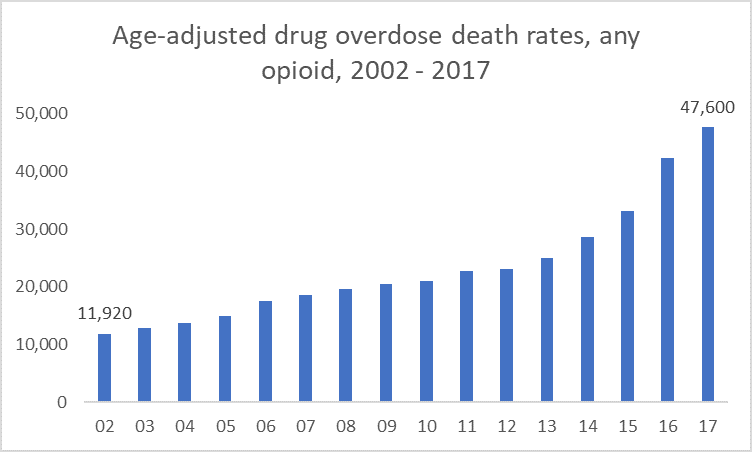 47,600 people died from an opioid-related drug overdose in 2017, making up fully 68 percent of total overdose deaths. That’s up from 11,920 in 2002. Dr. Vennela Thumela of the WCRI presented recent findings about the correlates of opioid abuse and overdose. She found that mining and constructions workers were most impacted, representing the highest percentage of opioid prescriptions among all workers receiving pain medications. Higher rates of opioid prescriptions also correlated with workers who are older, male, and live in rural areas. Dr. Letitia Davis, of the Massachusetts Department of Public Health, found Massachusetts-specific evidence agreeing with Dr. Thumela’s findings. The highest opioid overdose death rates in the state are for construction/mining workers and farming/fishing/forestry workers. Construction workers overdosed at six times the rate expected based on average experience. In fact, per Dr. Davis, 24 percent of all opioid deaths in the state between 2011 to 2015 were construction workers. It has also been a tremendous tragedy to the U.S. economy. 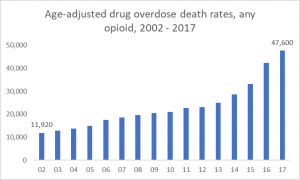 Dr. Krueger cited a 2017 Council of Economic Advisers (CEA) report, which estimated that in 2015 alone, the economic cost of the opioid crisis was over $500 billion – or 2.8 percent of GDP. Dr. Krueger noted that the number of opioid-related overdoses in 2017 increased by at least 50 percent since 2015 – implying a cost in 2017 alone of about $750 billion.